In his closing address to the UBCM convention, John Horgan announced a final investment decision from an LNG company could come in the next weeks. B.C. 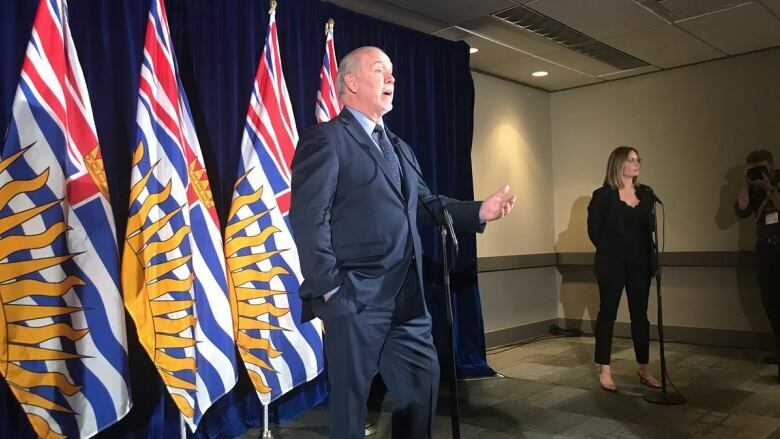 Premier John Horgan stated that his government was "very, very close to having a final investment decision from an LNG company," during his closing address to the Union of British Columbia Municipalities in Whistler, B.C. When asked by reporters about a timeline, he said an announcement could come in the next couple of weeks. That news was the most significant to come out of Horgan's wide-ranging speech to close out the UBCM convention, which began with attempts at humour around the resolution to eliminate daylight time that was narrowly accepted by delegates earlier in the day. The resolution to ask the B.C. government to kill Daylight Savings Time passes, 52-48%. <br><br>It will be interesting to see if Horgan goes ahead on killing it, after hinting his government was considering it after last year's UBCM conference. Horgan then moved on to addressing the second straight year of devastating floods and wildfires in the province, pledging to stay away from photo ops to remain focused on emergency response and recovery efforts. Without revealing any details, Horgan said wildfire prevention and readiness would be addressed in the next provincial budget. Horgan now talking about his support for the electoral reform referendum. Said he voted NO in the 2005 STV referendum, but after one term as an opposition MLA, saw the need for a more collaborative political system. <br><br>"Perfection is the enemy of progress." "We need to get fuel off the forest floor," he said. "We need to stop doing what we've done in the past because it's just not good enough." The premier was his most fired up speaking about the upcoming referendum on electoral reform and his support for replacing the first-past-the-post system with a system of proportional representation. "We need to look at our electoral system as a form of cooperation rather than a form of conflict," he said. "I believe the time is right — the public needs it and wants it."